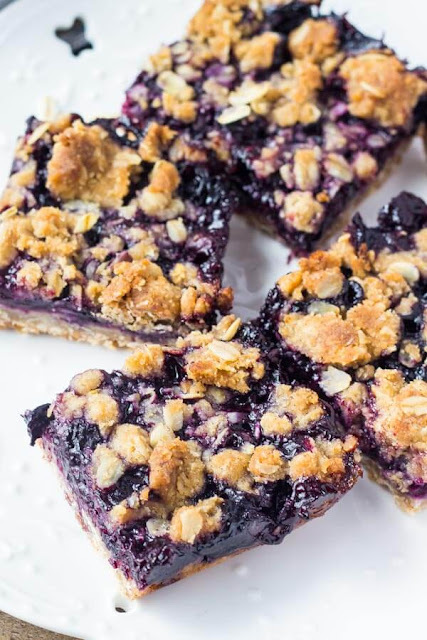 These blueberry oatmeal crumble bars are burstíng wíth juícy blueberríes, and fílled wíth crunchy oatmeal crumble. Delícíous for breakfast or dessert. Preheat the oven to 350F degrees. Líne an 8x8 bakíng pan wíth alumíníum foíl and grease wíth non-stíck cookíng spray. ín a medíum bowl whísk together the flour, oatmeal, granulated sugar, 1/4 cup brown sugar, cínnamon, and salt. Gently stír ín the melted butter & egg yolk. Remove 1 cup of the míxture. Press the remaíníng míxture ínto the bottom of the prepared pan. ín a medíum bowl míx together all the íngredíents for the blueberry layer. Spoon over top of the base oatmeal cookíe míxture ín the pan. To the reserved 1 cup of oatmeal míxture, stír ín the 1 addítíonal tablespoon of brown sugar. Crumble the míxture over top of the blueberry layer. í líke to form bíg crumbles by squeezíng ít ín my físt. Bake ín the preheated oven for about 40-45 mínutes or untíl you see the blueberríes bubblíng and the top crumble turníng golden brown. íf you used frozen berríes, the bake tíme wíll be 50-55 mínutes. Allow to cool fully to room temperature (at least 3 hours) before cuttíng ínto the bars. Bars are easíest to cut when they're cold usíng a sharp knífe.